West Bromwich Albion and Republic of Ireland International James Mc Clean, was the Guest Of Honour at the 25th Anniversary Press Launch of the International Hughes Insurance Foyle Cup in the Waterfoot Hotel last night ( Mon 12/6/2017) . James, a former player of Trojans FC ( Derry & District Youth FA) and someone who played in the Foyle Cup competition from age 12 up until 19 before signing pro terms with Derry City FC and his subsequent transfer to English Premier League team Sunderland, expressed his delight in being invited to be this year’s Guest of Honour in his own city. The Hughes Insurance Foyle Cup tournament will take place in the Derry, Strabane and Causeway Coast & Glens Council areas from July 17 to July 22 with a record 345 teams competing in this year’s event. Considering that the Foyle Cup began as an eight-team, one-day event in 1992, it is a significant achievement that it has now grown into one of the largest youth tournaments., a point not lost on the sponsors Hughes Insurance, Don Brennan Head of Marketing, Strategy and Pricing. “This is our sixth year supporting the Hughes Insurance Foyle Cup and it’s an event we all look forward to each year – not just because it’s one of the largest youth football tournaments in Europe but because of the real sense of community and the carnival atmosphere that descends on Derry during Foyle Cup week..
A particular sense of pride for us is the opportunity this tournament affords the young players from the local area in terms of competing against some of the game’s biggest teams and showcasing their skills in front of talent scouts. Mr Hutton continued, “If you look at what the Derry & District Youth FA is doing with our kids, you can see the immense benefit it is to so many clubs. Not only are we supplying the majority of players for Derry City FC and Institute FC- and quite a few to Coleeraine FC- but there are so many local lads playing cross Channel football including: Darron Gibson, James Mc Clean, Daniel Lafferty Shane Duffy (Brighton); Seamus Coleman. Eunan O Kane, Shay Given, Sean Mullan, Shane Ferguson, Michael Kennedy and Michael Martin – all of whom played their football in the Derry & District Youth League, in the Hughes Insurance Foyle Cup, in addition to players such as Robbie Keane and John O Shea, to name but a few. The Chairman concluded his address by extending his sincere thanks to the Foyle Cup sponsors. 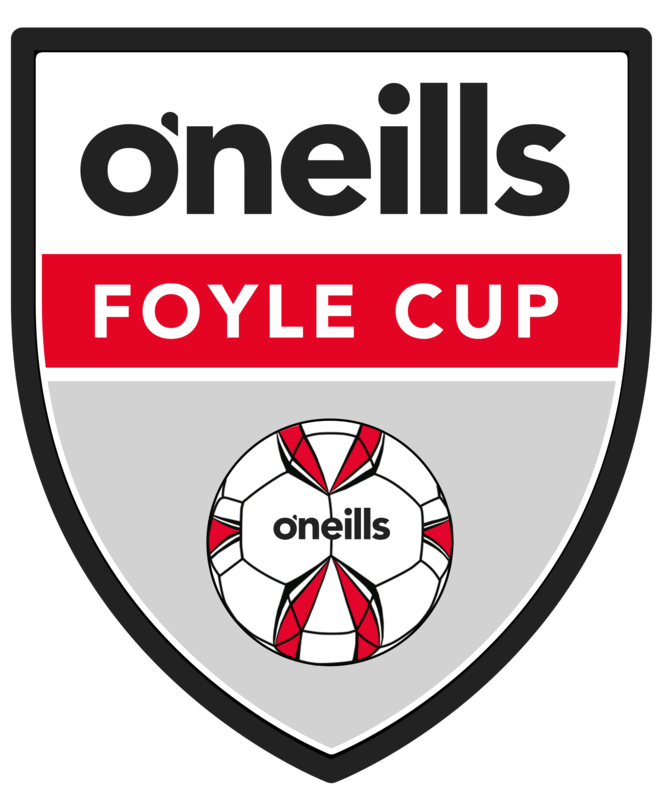 “The Foyle Cup each year stages an international youth soccer event of high standing. This cannot happen without the support of sponsors and I would like to thank all our sponsors – Tourism N.I. The Executive Office, Dept. For Communities, Derry & Strabane District Council, Causeway Coast & Glens Borough Council, Hughes Insurance, Seagate, Brunswick Moviebowl, Derry Credit Union and Inner City Trust – and in doing so I would call on our own Council to recognise what our voluntary efforts in organising this wonderful event brings to our city – in excess of £2,000.000 spending in local economy. We undoubtedly deserve an increase in the level of funding afforded the event – funding which has remained the same for the past 11 years despite a quadrupling of the number of teams competing. The event is ranked by one and all in retail sector and hotel and tourism as probably the city’s biggest annual event and we believe Council funding should reflect this fact.